FRA: Hi, welcome to FRA’s Roundtable Insight. Today we have Brett Rentmeester, he is the president and Chief Investment Officer of WindRock Wealth Management. He founded WindRock Wealth Management to bring tailored investment solutions to investors seeking an edge in an increasingly uncertain world, he’s a veteran in the industry. He was a founding partner of Altair Advisers, a $3 billion investment firm and he served on the Investment Committee with a specialty in alternative investments opportunities. Prior to that, he was a manager at Arthur Andersen, helping to build their Investment Advisory and Private Client Services practice. He’s a CFA and also earned a Chartered Alternative Investment Analyst designation and he has an MBA from Northwestern University’s Kellogg Graduate School of Management. He also has activities as a philanthropic donor in areas of serving as the founding Board Member of the Northwestern Center for Integrative Medicine and a member of the Major Gifts Committee of the Edward Hospital Foundation in Naperville. Welcome, Brett. Brett Rentmeester: Hey thanks for having me, Richard. FRA: Great, today we would like to discuss with you a topic that you have keenly on your mind and that is in the area of cryptocurrencies. First, before we begin would you like to give a disclaimer? Brett Rentmeester: Yeah, I think it’s important to just mention that we’re going to be talking about the theme cryptocurrencies in general, and in no way should this be considered investment advice in that people are always encouraged to talk to their investment advisors. The interviewee personally owns cryptocurrencies including bitcoin and ethereum. FRA: Great, thank you. And so yeah, we’d like to go over a number of developments in the cryptocurrencies space. What’s happening and the technology behind that, the blockchain technology, what are the advantages of the technology, the power, the features that it is bringing to the economy? And what are merging applications that you see coming about? Also, we can go into a bit on the actual cryptocurrencies, your thoughts on Bitcoin, Ethereum, and others. FRA: So I guess to begin with can you give us an overview of cryptocurrencies in terms of the history and evolution? Brett Rentmeester: Yeah, and it’s a great place to start because what we find is there’s a lot of misunderstanding. And as you and I were talking earlier, Richard, it is quite analogous to the early days of the internet. And when you think back to the perception in say 1994, if you said the word internet, most people had heard that word but probably associated it with this idea of some online college chat room. And then a couple years later they realized that it was a great place to find information and now they’ve realized that it’s changed the whole world and most business models along with it. So we think cryptocurrencies are really at that same stage, that the first reaction is people have heard of Bitcoin but associate it either with criminal activity or maybe think of it as internet monopoly money. But then they dig deeper and they find there is something to Bitcoin which is pretty unique which we’ll talk about, and then as they get past Bitcoin they realize Bitcoin is really just the beginning of this whole wave of cryptocurrencies and blockchain technology that’s going to change a lot of how businesses operate globally. So when we go back in the story of Bitcoin which was the first cryptocurrency, it dates back to 2008, and we think of it most easily as a sort of virtual money and payment system. So if you think of payment systems like PayPal or Western Union, you know it’s got some of those elements. And it was started by a mysterious founder that nobody really knows named Satoshi Nakamoto. And by owning Bitcoin you’re essentially owning a piece of the system, which again some people associate with a store of value, but at its core, it’s a payment system globally. But the real key behind Bitcoin and all these cryptocurrencies is the technology which is referred to as blockchain. And what’s really interesting if you think of Bitcoin is, compared to a bank, if you go to a bank and try to get your money, we’re long past the days where they go to the vault and pull out real physical money. It’s really a private accounting ledger, that the bank has, and they’re the middleman and they have to give you access to your money. Well, Bitcoin has taken that and made it a public accounting ledger. Something that’s transparent that gives you control of your own money where instead of having a bank as a middleman, it’s really a system that’s peer to peer. So the system’s maintained by all of these users and a group of people referred to as miners that help audit the system. So every transaction is seen in the light of day and it takes a number of people almost auditing it to confirm a transaction. So you get rid of the bank and the middleman. And what this really creates and has created in Bitcoin is this idea of a trustless system. The idea that for you and I to transact, I don’t really need to know who you are or trust who you are as a person, do my background check, all I need to know is I need to trust the Bitcoin system itself that if I’m receiving a payment from you that the payments been received, or I’ve sent the payment to you. So in this way it’s really revolutionized money and payment systems because now I don’t need a bank, I don’t need a middleman standing between me and my money. So as I mentioned earlier we’ll go into some of the tenants of blockchain in more detail. This movement is really much bigger than Bitcoin. Bitcoin is kind of the beginning, the application of a payment system and maybe a store of value. 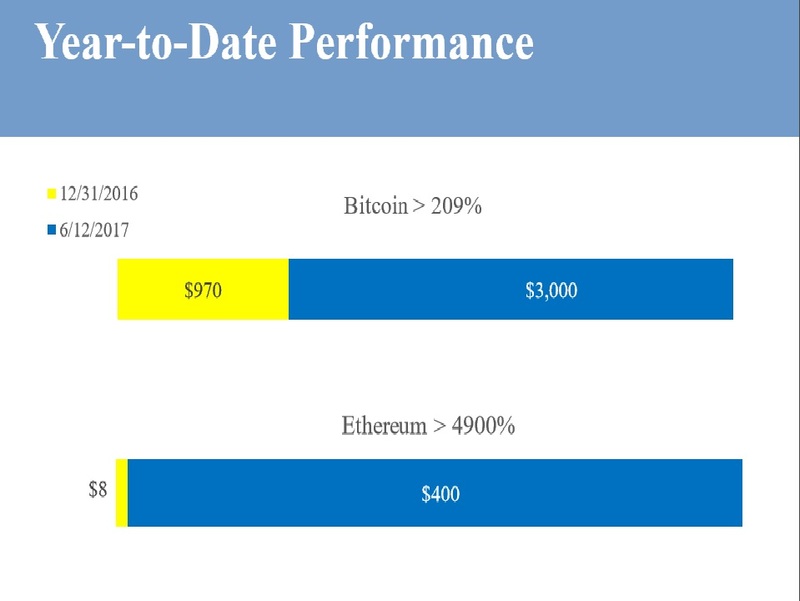 The next big wave in the development was really the founding of Ethereum in 2014. Which in layman terms I’d call kind of a technology protocol or open source systems where developers can actually build applications or so-called smart contracts that are using blockchain technology in different business applications to get rid of the middleman. So this time not in banking and money transfer, but in other industries where we’ve long relied on a middleman or gatekeeper in the middle that’s taking a fee. So it’s almost like a Microsoft operating system for blockchain applications, and that’s given way now to really a rush of new companies in almost every industry. FRA: And you’ve kindly provided a couple of interesting charts which we’ll make available in the write-up, the transcript to this interview discussion on Bitcoin and Ethereum very interesting fact that you have there is that the total market capitalization attributed to Bitcoin and Ethereum is 73% out of a total number of cryptocurrencies of over 700, that’s quite fascinating. Brett Rentmeester: Yes, yes absolutely. And yet the entire space is only about $100 Billion which although a big number, pales in comparison to some public companies out there. So it’s really in its early innings. FRA: And so, what is exactly blockchain if someone was to ask, inquire. What is the nature of that technology? Is it sort of like a secure spreadsheet? Like an Excel spreadsheet that’s secure in some way? Brett Rentmeester: Yeah, well I’m not a programmer but conceptually I think it’s an accounting ledger. It’s a record keeping mechanism, a program, an algorithm that’s keeping record of all transactions. So if I send Bitcoin to you it’s transacting that I used to be the owner of that block on the chain or node and now you are. So it’s a way to make something where you used to need a middleman keeping tally of all of that to allowing a computer program to do it. But really the genius behind it is empowering the users to verify transactions. So if you and I have a transaction, before it can complete it takes a certain number of users that are active and supporting the network, those are referred to as miners, almost like gold miners in a gold analogy, to actually audit and confirm that transaction. So it’s almost like I can feel secure in the fact that we made a transaction in Bitcoin and I got my money because a dozen people did an audit on it before it could go through. So the chance of them all colluding or something happening is pretty low. That’s the best way I can describe it to someone who’s not a programmer. FRA: And what are some of the emerging blockchain applications that are currently out there and that are coming out in the near future? Brett Rentmeester: Yeah, well I guess to give a little perspective to that, maybe just back to the internet analogy for a minute can kind of give the framework of what’s coming out because obviously the internet is probably the most sweeping technology of our time, and it did liberalize information sharing and collaboration. But it had two primary problems that blockchain helped solve. The first was, even though it’s the system we all use, it’s still controlled by big corporate users. Meaning if you’re on YouTube, YouTube gets most advertising revenue, not the posters of content or the active users. Same thing with Facebook, most of the economics go to Facebook the company, not the most value add users and active users. We’ll talk about how blockchain solves that, but the second thing with the internet is everything went digital in the world, but we still don’t have a way to feel great about the security of data. So cybersecurity is still a huge issue. So what the blockchain has allowed and where these businesses are popping up are in a couple of areas, but blockchain has allowed: 1 the power to come back to the hands of the people as we’ve talked about. So, instead of Facebook getting all the economic benefit, there are models out there now where the users get the most economic benefit. If you post a video or an article and it has a huge amount of hits, you’re actually going to be rewarded in the token or currency of that system. And if you’re a contributor and you make value added comments you’re going to get a reward; it’s not going to go to a platform provider like YouTube or Facebook. So I think that key concept of it being peer to peer has a real power to it, because fundamentally it cuts out the middleman, and we’ll talk in a minute about other areas, but I think social media is ripe for this. The idea of these are peer to peer social networks, why are all the economics going to be companies? So again, this is as you and I talked from a financial repression perspective, this is a very empowering concept because it’s putting control back in the hands of individuals and really away from governments and big companies because they’re not needed as the middleman. The second big problem of security, we think the blockchain helps solve. I don’t want to say it’s an unhackable technology, but let’s call it virtually unhackable. Meaning there’s no corporation, no CEO, no central server that can be hacked. It’s literally a web of users, a whole ecosystem where the blockchain is copied and replicated on all the user computers such that if one or two computers or one server is infected with a virus, it’ll be identified by the remainder of the network. So it’s possible to be hacked, but it would be much harder than today where people are hacking into single servers. So when you start going one step deeper on what are the applications coming out, we talked about some of the social media ones, and they go by names like Steemit and LBRY credits and SingularDTV – I mean there’s all these upstart ones that are replicating YouTube and Facebook and other things. And again incenting the users and the content providers. There’s also people out there in the esteem of giving power back to the people of allowing you to earn money on things you have to lease out. One of the more interesting ones is Golem where if you have extra computing power you can basically lease it out and somebody can garner all the world’s computing power into probably the biggest supercomputer in the world. And you, the person lending out your CPU power in getting incentive for it in Golems coin or token. So you’ve got some really innovative things, you’ve got gaming coins coming out, the idea that maybe fantasy sports, maybe normal gaming will start rewarding winners and users using their own coins. So you have this whole element of peer to peer coins and things that we’ve already got natural networks. On the other side though, back to the cybersecurity, we talked about the issues of sensitive data and all these hacks and cybersecurity issues we’re finding. And so I really believe any sensitive data in the future is going to run through some sort of blockchain technology. Now that may be blockchain technology developed by private corporations for their own company, maybe some of these other applications. But you’ve now got companies out there trying to use blockchain to make healthcare records unhackable, you’ve got companies out there like Storj coin (note: I keep say companies but I’m really referring to coins or tokens) where their trying to create an unhackable cloud storage service. So if you’re backing stuff up, personal information, pictures, things to the cloud, that can’t be easily hacked in the way it can today. Those are two things that I think solve the issues you talked about, but this idea of a trustless system in eliminating the middleman goes even further and can disrupt almost any industry with a middleman. So think of industries like real estate where you’ve got escrow companies and title companies, all these people in the middle of a transaction just to make sure you’re both good parties and both parties makes good on their promises. Blockchain technologies could end up eliminating all of those middlemen in the future. Or even things as common as stock exchanges today, I mean why can’t there be a global network of peer to peer users trading Apple stock where there’s no middle centralized exchange taking a fee from every transaction. Now, I think you might have a couple of thoughts with the regulatory issues with that, but conceptually this idea of getting rid of the middleman. Instead of seeing all these IPOs on Wall Street where Wall Street takes a huge fee, we’re starting to see this new phenomenon referred to as Initial Coin Offerings (ICOs) which are these businesses coming out and not paying fees to Wall Street, but coming out and issuing a coin, almost like a crowdfunding where people that put money in get a coin which inherently is a piece of the system. So the value in the coin is you own a piece of the platform. And interestingly enough, Richard, this year alone the initial coin offering market has raised $327 million whereas the venture space has invested $295 million in these technologies (source: Coindesk). So you’re starting to see this initial coin offering market take off and maybe that’s the future of fundraising. Again, unless there are regulatory issues that pop up but they haven’t thus far. FRA: That’s all fascinating. So this represents potentially incredible opportunities in a number of areas? Brett Rentmeester: Yes absolutely. And it’s really just beginning so you know irrespective as to whether somebody wants to be an investor in this space I think you can step back and think about our economy today and look at industries that are likely to be disrupted and think critically about what to do about it if you work in one of those industries. Or it could be an opportunity for entrepreneurs to disrupt many industries. FRA: And a key point on these blockchain applications is that a number of cryptocurrencies can be applied to each application, we’re not mandated to use Bitcoin or fixed upon one cryptocurrency. It’s all likely to be interoperable, your thoughts on that? Brett Rentmeester: Yeah well that’s right, I mean that’s what makes it so exciting, it’s true entrepreneurial spirit at its best. Bitcoin right now is, by market cap, the largest payment store value system, but this is technology so it doesn’t have to stay that way. Just like Myspace disappeared and Facebook came out of second or third place or wherever it was, it is uncertain who will be the winner. But because these are not corporations and centrally controlled enterprises these platforms as I’ll call them evolve themselves meaning Bitcoin today and Bitcoin five years from now could be very different things. And it’s really up to the Bitcoin user base and again these more active miners who are maintaining the system and collectively kind of voting to make changes to see what things evolve. So if there’s an upstart coin that’s competing with Bitcoin, Bitcoin itself could decide to change to be more competitive. So it really is this amazing free market experiment right now that’s a little bit like the Wild West. And I mean that’s part of the caution because you’ve got a lot of ideas being funded that are simply ideas. And you’ve got other businesses that might be great ideas but are at the very beginning. Now again if we were critical and went back and looked at the first week of YouTube being out there and the early days of Facebook, I’m sure it would leave a lot to be desired too from where they’re at today. But it is an area that’s highly volatile and very exciting, but it’s definitely the Wild West. FRA: So if we focused down on the actual cryptocurrency landscape, what does that look like today in terms of the types of cryptocurrencies, what they are, and what their potential is? Brett Rentmeester: Right now by most counts there are about 750 cryptocurrencies, so more than anybody probably thinks there are. But collectively, it’s only about $100 billion of value. So again, imagine if you could have gone back in the early days and someone told you all Internet stocks together are $100 billion, it may seem like a big number but now that we sit here today in 2017, if you could have bought the internet for $100 billion you would have done it. So I think there are a lot of companies, there’s only a handful with scale right now, and that’s why when you cited earlier Richard that Bitcoin and Ethereum together are over 73% of that market capitalization they’re the big ones, but the space is just beginning. I mean a lot of these coins a lot of these ideas I’ve referenced are things that have just come out in the last six months. So this is brand new. So just like YouTube started with a couple million dollars invested and it’s now probably a $10 billion plus enterprise within Google, you know some of these things will likely be big disrupters. Now that’s not to say that the entrenched powers won’t evolve and try to engrain blockchain technology in their systems as well, but I think what makes this exciting and so disruptive is that the whole concept is peer to peer. That means users and content providers should get paid, and not just the corporations. So I think it’s a fundamental shift we’re seeing. You know, we’re seeing a lot of people really interested in blockchain and not quite sure how to navigate the space as they look into it because it is brand new. FRA: And what is the potential evolution? Do you see governments getting into this in terms of establishing cashless societies based on cryptocurrencies by using government based cryptocurrencies? And will governments allow the use of non-government cryptocurrencies like Bitcoin or BitGold, other types of cryptocurrencies, do you see that happening? Brett Rentmeester: Yeah, I mean you’re right. The risks out there, the primary risk is what governments do because there is no telling how far they can go to stop it. But I use the same analogy back to the internet, even if they wanted to stop the internet, could they have? I don’t know. And would they have shot themselves in the foot so much by giving up that economic benefit? So it’s tough to say, I mean the central banks andgovernments we know want control. On the other hand, right now you’re starting to see more and more countries kind of throw the towel in and say we can’t control this because it’s not a central entity it’s not just something local, it’s a global market. So if we shut it down in America and everybody else adopts it, they have a huge technological lead over us. And so you’ve seen some really interesting developments, you saw Russia go from very adverse to all these cryptocurrencies to being very open about it. In fact Putin just met with Vitalik Buterin, the founder of Ethereum I think last week, so that’s an interesting sign. Japan just on April 1st made Bitcoin legal tender, you know as good as the yen in the country, so think of that impact. So if you’re a Japanese investor under that system and burdened with that debt with negative interest rates, you’d think everybody would put a piece of their money in something like that. And you’ve even got countries like Australia slated this summer to make Bitcoin and other cryptocurrencies legal tender. So I don’t know, you would think it’s one of two things. Either governments are letting this happen to allow people to become used to a cashless thing and then might come in and try to enforce their own system, or they’ve conceded they can’t control it. I don’t know, do you have a point of view on that? FRA: I think that it’s likely that the cryptocurrencies which are based or regulated within the financial system and perhaps privatized would likely be allowed to coexist with government based cryptocurrencies. So if you have a cryptocurrency like BitGold which provides compliance to regulations within the financial system, even though it is outside of the banking system, it does comply with the banking type of regulations for deposits. So I would say in that case the governments would allow those types of cryptocurrencies to coexist. And in that sense, it’s better to have or to be into cryptocurrencies which are either backed by some type of commodity like gold or perhaps just private based relative to government fiat based cryptocurrencies. Brett Rentmeester: Right, but it does bring up a good fact. I mean given that the fractional reserve banking system is so over-levered, globally, but just thinking about the U.S. for a minute if everybody put 5%-10% of their money in Bitcoin or some other cryptocurrencies, the whole banking system implodes on itself. So you’re right, it’s really unknown forces ahead. But right now, even in the U.S. there hasn’t been a big move to crack down on it. I mean even though it’s not treated as currency and tax-free, it is given capital gain treatment for long-term holding which is more beneficial than some other assets. So I don’t know, again I’m back to it’s a global world, so a country that chooses to really crack down on it faces a big technological disadvantage relative to other countries that are endorsing it. And so I think you’re going to have a race for countries wanting to endorse it. But maybe the risk is a big global clampdown at some point, it’s hard to say. But for right now the future looks really bright from a technological point of view. FRA: What are your thoughts on these cryptocurrencies as being stores of value? Do you see them as more of payment systems? Are they deriving a lot of their value from the ability to move money around? Like many have pointed out the use of Bitcoin by Chinese and China looking to diversify outside of China in terms of their asset holdings? So perhaps some of the value has been derived from that utility value, being able to move money around. What are your thoughts on that? Is it a real store of value? Brett Rentmeester: Yeah, well it’s an excellent question because I think one of the biggest questions most people new to this space have is why do these things have any value? Explain to me why Bitcoin is worth what it is, or Ethereum. And so when you step back, I guess the way I view it is owning a coin, a Bitcoin or an Ethereum token, is essentially owning a piece of the platform they’ve created. So it’s not that different then if Facebook, instead of being a public stock had Facebook coin. And if you owned 10% of the Facebook coin it was like you own 10% of Facebook. So I view it very analogous to owning equity. It’s almost like you own a piece of the system. So if the system is Bitcoin and you believe it’s a valuable payment system and more people will come on board, that in of itself is a form of store value. Now, that may be different than owning gold and other things, I don’t think we have to say they’re the same, they’re not, but just say it’s a payment system for a moment. The current market capitalization or size of Bitcoin is about $43 billion, so it’s grown a lot, it’s done tremendously well. But the market capitalization of PayPal, another payment system is $61 billion. Visa is $211 billion. So I step back and say, okay is the value assigned to all of Bitcoin reasonable? It sure seems like it to me, because I would imagine Bitcoin’s got the potential to be much much bigger than PayPal, and probably surpass a lot of these credit card valuations over time. So I look at it that way, but it is a hard thing to assess. Same thing with Ethereum, I don’t have the number in front of me I think there may be $34 billion, but you compare that $500 billion for Microsoft, you know could they be the next “operating system for blockchain applications” they could be, they may or may not be. But you know I think you have to look at value on a relative basis and acknowledge that what you’re really owning when you own a coin is a piece of the system. I think once you get to that level of understanding, it’s a little easier to think about how value works and why people are assigning value to these tokens or coins. FRA: So is it in a bubble or is it just volatile just like the other currencies? Brett Rentmeester: Yeah, I think it’s just inherently volatile because it’s unregulated and it’s the Wild West and it’s got a trajectory that’s going to happen quicker than the tech boom did. So if technology stocks started surfacing around 1994-1995 and ran to 2000, so five to six years, maybe this is a tighter cycle. I think we’re going to see a bubble perhaps, but I don’t think we’re there yet. And I say that because in all the anecdotal evidence we get we find that still, most people don’t really understand this space. In polling people almost nobody’s an investor even in Bitcoin and Ethereum. If you really ask 1,000 friends that are pretty well to do with money, very few people actually have money in. So I think the space from an investor point of view has been dominated by kind of techies. People that knew the technology and got involved early and get it. Or some traders. And it’s a difficult space to navigate, it’s not as easy as just going to your Fidelity account at least today, or Schwab and just buying the stock, you have to navigate these private exchanges, you have to hold it in these things called private wallets, there’s a lot of security issues you’ve got to be aware of. So it’s a pretty treacherous thing, it’s taken us a long time as investors to get up to speed on how you navigate it. So I think given how rough the landscape is of doing it, it just seems to me like the demand side is just beginning. That if the door starts opening for easier ways for people and institutions to put money in, you’re going to see the demand side grow and you’re also going to see the supply side grow as these disruptive businesses shake up other industries. So I think again the analogy’s pretty good with the internet boom, you’re going to see probably a big boom ahead. And somewhere down the road, you’re going to see a washout of a lot of the ideas that should have never been funded or really had no use. So like the modern day Pets.com, some of that. But out of those ashes will come the Facebooks, the Googles, the Amazons and everybody else. So, it’s going to be a highly volatile area, but I think for people that are looking for the next growth engine in the world, there’s no more exciting place than this. I think the blockchain tsunami has really just begun to sweep over the world. FRA: Yes, and as you mentioned, we are in the second inning only. And also you mentioned this technology will revolutionize almost every business. Brett Rentmeester: Yeah, it’s pretty remarkable. The more time I spend on it the more excited I get about the prospects for blockchain and in all the applications in the future. So I think for those people that aren’t taking the time to really understand it, they’re missing something arguably as big as the internet revolution where they can take the time and understand it today they will have such an edge ahead. FRA: Well great, thank you very much for your insight, Brett. How can our listeners learn more about your work? 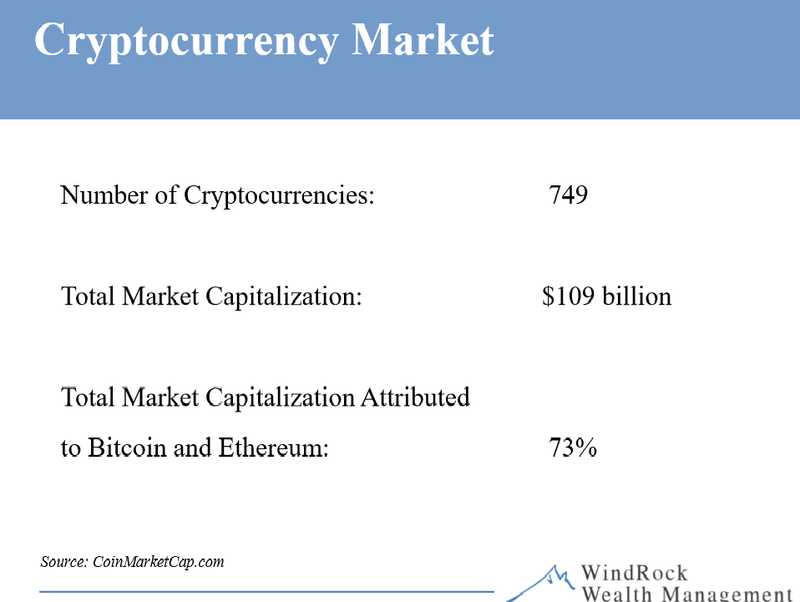 Brett Rentmeester: Yeah, they can go to https://windrockwealth.com/ that’s our wealth management company, we have a research and analysis section. Or they can reach out, I’ve got a long email but it might be in the reposting. I’ll leave my phone number which is 312-650-9593. We’re investors in this space and we spend a lot of time understanding the structure of the space, and it’s very unstructured, like we said it’s the Wild West. So anybody dabbling in it needs to be very careful, but by the same token, it’s a very exciting space to be part of. FRA: Excellent, great, thank you very much Brett. Brett Rentmeester: Thank you Richard.